I decorate my home up with gold accents all throughout the year, but during the holidays, I decorate with even more gold. The color scheme in my home lends to gold accents, and I’ve always loved how gold adds a warmth and richness to any home decor. I bring out my gold flatware set and my gold charger plates for Thanksgiving and Christmas. I love how the really make my dining table shine. I need some dripless gold taper candles and a serving platter. And I am so wanting the gold foil throw pillow below. A girl can’t have enough gold! 1. Gold foil throw pillow (buy) 2. Appetizer plates, set of 4 (buy) 3. Gold charger plates (buy) 4. Gold leather Moroccan pouf (buy) 5. Gold-patterned Champagne flutes (buy) 6. Gold brocade goblets (buy) 7. Gold finish side table (buy) 8. Mercury glass apothecary jar (buy) 9. Gold sunburst napkin rings (buy) 10. Gold table lamp (buy) 11. Gold mercury glass votive (buy) 12. 24-piece Midas electroplated flatware set (buy) 13. Food-safe gold glamour serving platter (buy) 14. Dripless gold taper candles (buy) 15. Italian crepe paper table runner & paper roll (buy) 16. “Cheers” serving tray (buy) 17. Le Souk gold-themed table setting – EVERY-thing your table needs (buy). Do you decorate with gold accents during the holidays? Or what color do you accent with during the holidays? Yes, I love gold especially for the holiday season. It just seems more festive. What lovely items. Thank you for sharing. Gold is so pretty during the holidays. What a lovely post. I’ve been dressing my home up in gold a lot lately and I love how festive it makes my home look. I LOVE those champagne flutes! Commenting from the Flash Giveaway!!! I love #17 would be nice to have that kind of setting for a holiday dinner!! If you have a post you would like to share, I would like to invite you to stop by for Friday Feature Linky Party!!! oh my goodness! I want all of these! Gold is my favorite accent color. It’s perfect al year long. This is so pretty! The gold accents really brighten up the area. Golds are so pretty to decorate with. I love decorating with gold accents for the holidays too.. it adds such sparkle to the table and I just love it. I really love the gold flatware. Makes me feel like I am eating such a special meal… and we really are! These items are so festive. I would love to do something pretty in my house! I love the Gold Accents. I’m a very traditional ‘Christmas decorator,’ everything at Christmas in my house is green/red/gold. So all of these would fit in great in my décor. I especially like those gold wine goblets – so elegant. I have a gold pouf and I love it. Gold is my color this season! I’m no decorator, and you can tell by the boring design i have in my living room!! Lol But i really like the look with the gold accent!i will definitely be making some changes before Christmas! !thanks for this post! ! You can’t go wrong with gold no matter if it is decor or jewelry! The goblets would be my first choice. Lovely things. I love #4 and #6. Gold is just perfect for this holiday season. I noticed a lot of the clothes in the girls section have gold on them the last few months. My grandma used to have a black ceiling with gold marble all through it. Gold is my daughter’s favorite color. I would love to incorporate a little more sparkle for her so it feels like her home, too. I really like the charger plates and the side table, simple ways to add a gold accent. I’d love to decorate with gold… so luxurious! I don’t accent with gold. 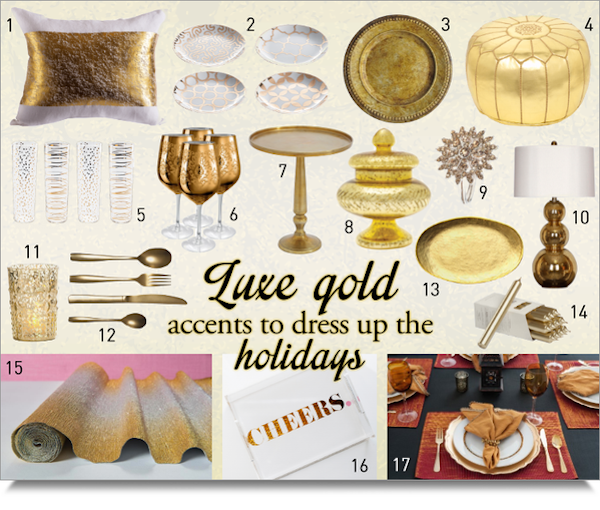 I love the idea of decorating for the holidays with gold accents! I decorated my tree last year in gold. I think I’ll decorate with more gold this year! This could be a great decoration idea for Xmas this year. We’ve always had red theme since I could remember. I love everything you featured, especially that pouf! This makes wish I had another room in the house to decorate, because I love gold. That gold moroccan pouf is so cool, LOVE IT! Some really fun items here. They would liven up my home that’s for sure. I am usually not big on gold and prefer silver, but I actually purchased gold holiday dresses for my daughters this year and really loved the overall look.